This visible image of Hurricane Rafael in the North Atlantic was taken from the MODIS instrument aboard NASA's Terra satellite on Oct. 17 at 1440 UTC (10:40 a.m. EDT). Rafael's northwestern fringe clouds were brushing Nova Scotia, Canada (top left). Hurricane Rafael ended its run as a tropical cyclone yesterday (Oct. 18), when it merged with a cold front off the coast of Nova Scotia, an event caught by NASA's Terra satellite. 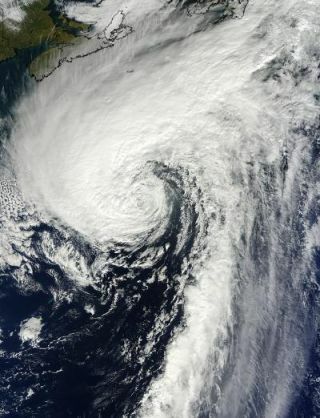 Rafael became an extra-tropical cyclone the previous day as it moved northward in the Atlantic Ocean. Tropical cyclones (the generic term for hurricanes, tropical storms and typhoons) are fueled by warm tropical ocean waters and moisture-filled warm air that drives the overturning in the atmosphere that create thunderstorms; extra-tropical storms have shifted to become cold systems that are just like the low pressure system that sweep across the mid-latitudes and bring storms with them, a NASA release stated. At the time it made that shift, Rafael still had hurricane-force winds that had a maximum speed of 75 mph (120 kph) (the threshold for hurricane strength is 74 mph). The following day, Rafael merged with the cold front; the fringes of the former hurricane were barely brushing the coast of Nova Scotia, as can be seen in the Terra satellite image. Rafael was the ninth hurricane of the 2012 Atlantic hurricane season and the 17th named storm (storms are named once they reach tropical storm status). The storm spun up during the "second peak" of hurricane season, which historically comes in the middle of October. The main peak of storm season is during August and September. This hurricane season has been an above-average one; an average season sees 11 named storms, six hurricanes and two major hurricanes.